I know many of you have heard us speak of our family group that we belong to. This is a big part of our life at New Hope. I thought it might be interesting to introduce everyone to the family throughout the next months in a series of blogs, each blog highlighting a different member of the family. That way you could get to know them and know how to pray for the family and each individual. Let me start with a brief introduction. 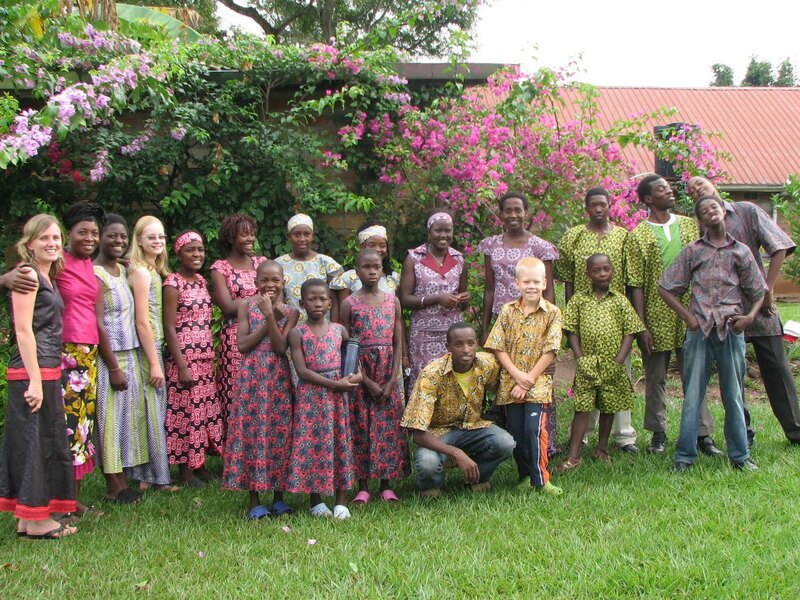 Our family is called Ebenezer family and consists of nineteen children ranging from ages 5-18. They live together on a family compound with a family Mother and Father, a married couple, Florence and Godfrey Musambu, who have two children of their own. Aunt Florence and Uncle Godfrey live in a separate house with their children, Brian, 12 years old and Jonathan 18 months old. The rest of the children live in round huts with up to 7 beds in each house. The boys all fit into one house and the girls are split into two houses. There is a round open air hut or banda with a large table and chairs where the children eat and do homework, or just hang out. Also in the compound are various structures. There is an open air cooking area where the meals are prepared in large pots over wood fires. There is a storage building for the food, chicken coops, a pig sty and outdoor pit latrines. Around the compound is the family's farmland and fruit trees such as banana trees, guava trees, and papaya trees. A typical weekday might look like this: up at 5-6AM for study and preparing breakfast. (the children take turns cooking their own meals) School starts at 7:30 and lasts until 2:00PM for the younger ones and 4:10 for the older ones. After school the younger children come home and rest and do various chores around the compound. 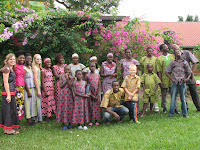 When the older children come home, they immediately get changed and go into the gardens to work until about 6:30. Then they come home and bathe and have devotions. Dinner is usually around7:30. After dinner they study until they go to bed which is around 9:00 or 10:00 for the younger ones and even later for the older ones. On weekends, the schedule is a little different. They get up around 6:00 or 6:30 and go to the gardens to work until about 10:00. Then they have breakfast and begin chores of washing their clothes and cleaning the rooms and compound. When they are finished they either rest, study or are involved in various activities. Saturday night is a game night. Sunday they go to church from 10:30 to 1:30 and then play soccer, study, rest or are involved in various activities. The weeks are very full for them! I probably need to explain the school system The kids start official school in Primary 1, which is like first grade. They are generally about 7-8 years old, although the ages vary depending on when the family can send them. Education is not free here, and many families struggle to afford the school fees and uniform. The primary school lasts up to primary 7, when they have to take a test called the primary leaving exam to see if they graduate from primary and can go on to secondary school. The secondary school is much like our middle school and first two years of high school. There is secondary 1 through secondary 4. At that point they take a test to see if they will go on to the last years of secondary, secondary 5 and 6. The first years of secondary are called '"O" levels and the last two years are called "A" levels. At New Hope, they take a year off from school between the "O" levels and "A" levels to receive discipleship, mentoring and work in internships. This helps them transition to "A" levels and to get a more focused direction for future schooling. It is also a valuable time to own their faith as they will have to go to boarding school for "A" levels since New Hope does not yet have an "A" level school here on site. This year has proved very important for the students, and is an area Tim has enjoyed being a part of. Many people ask what the kids normally eat. Breakfast is a porridge of cornmeal called posho. Lunch consists of posho flour made into a more solid form that you can eat with a spoon served with beans. Dinner is the same. They also eat whatever fruit is in season and occasionally vegetables from the garden mixed in the beans. On special occasions like holidays, they have a variety of other foods such as matoke (cooked bananas) with peanut sauce, rice, potatoes and meat, usually beef or pork. Chicken is a delicacy here and rarely served. They also occasionally have Micah's favorite, chapates, which are a sort of thick, bready tortilla. They drink water except on special occasions when they have sodas or a koolaid type drink mix. The kids laugh a lot and love to play and hang out with each other. The boys particularly like football, which we call soccer and the girls like games. They have all grown to like basketball as Tim has taken them to play several times. Riding bikes is also a favorite activity. And like most kids, they really like to watch movies! Well, I hope you have a better idea of what life is like in our family group. Stay tuned for my next blog when I highlight a member of the family!